Sumo wrestlers in an outside arena at Eko-in Temple (回向院) in Ryogoku, Tokyo ready to start a bout. 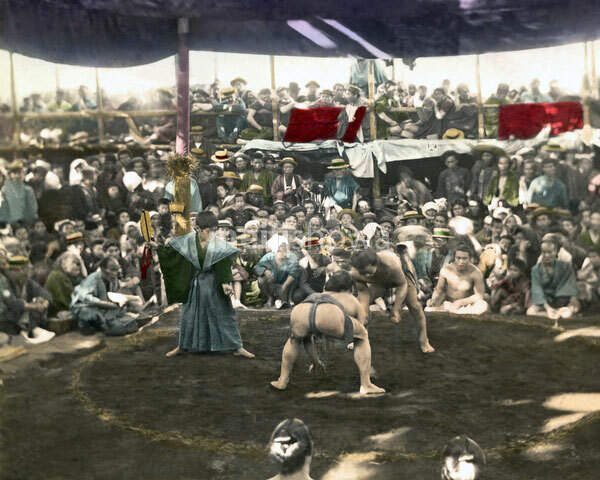 The temple was known as a sumo wrestling venue during the Edo (1603-1868) and Meiji (1868-1912) periods. The first bout was held here in September 1768. From October 1833 (Tenpo 4) to 1909 (Meiji 42), the period of “Eko-in Sumo” (回向院相撲), all sumo tournaments were held at the temple.